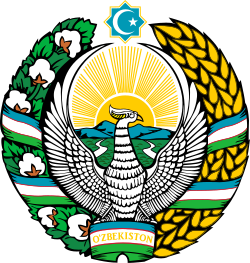 The state emblem of Uzbekistan was adopted on January 2, 1992. It is similar to the emblem of the previous Uzbek SSR. Like other post-Soviet republics whose symbols do not predate the October Revolution, the current emblem retains some components of the Soviet one. Prior to 1992, Uzbekistan had an emblem similar to all other Soviet Republics. The emblem is in the form of a circle and mainly bears the national colors blue, white, and green, replacing the Soviet motto "Workers of the world, unite!" where the red ribbon previously stood. On the left there is a cotton plant and to the right wheat borders the insignia, cotton and wheat are the two major agricultural products of the country. It is surmounted by the star of Rub El Hizb (۞), a symbol of Islam, which a majority of Uzbeks profess. In the center, a right-facing khumo, a bird symbolizing happiness and love of freedom, is displayed with wings outstretched. Enclosed by the khumo's wings is a depiction of the rising sun over mountains. Two rivers, the Amu Darya and Syr Darya, flow from the mountains and crepuscular rays emanate from the sun. The khumo is perched on a banner at the base of the cotton and wheat borders which bears the national colors and the name of the country in Latin (Oʻzbekiston) script. Karakalpakstan uses emblem with similar design. The state emblem of Uzbekistan approved by the law of the Republic of Uzbekistan of 2 January 1992 No. 616-XII "About the State emblem of the Republic of Uzbekistan" (decree Law introduced by the sun). In the centre of the emblem depicts Huma bird with wings spread — in Uzbek mythology, the symbol of happiness and freedom. Uzbek poet Alisher Navoi characterized the bird Humo as the kindest of all living beings. In the upper part of the emblem is an octagon, symbolizing the approval of the Republic the Crescent and the star. The image of the sun symbolizes the light that illuminates the path of the Uzbek state, as well as emphasizes the unique natural and climatic conditions of the Republic. Two rivers, represents the wish that the Amu Darya and Syr Darya, which flow in the territory of Uzbekistan. The ears are the symbol of bread, stems with open cotton bolls characterize the main wealth of Uzbekistan. Together, wheat and cotton bolls entwined with ribbon of the national flag, symbolize the consolidation of the peoples living in the Republic.